Size: 240' Easy Flex Heavy Duty No-Dig Edging is easy to install right out of the box. Nostraightening or heating in the sun to make it flexible. Easy Flex Heavy DutyNo-Dig Edging has a thicker and higher wall compared to Easy Flex No-DigEdging. To install, place the edging in the desired shape and location. Hammeranchoring spikes through the tabs on the edging. It is recommended to placethe spikes a maximum of 40 in. apart. 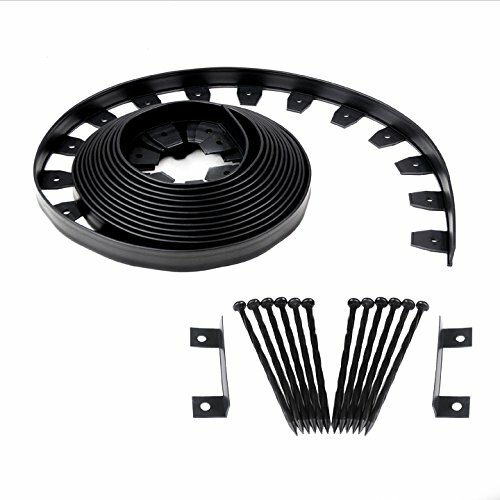 Pack includes (6) 40 ft. coils, enoughto do a 240 linear ft. installation. Multiple sections can be linked together.When connecting end to end, place the included connector on the bed side andspike through connector and both end pieces. Pack includes (72) 8" anchoringspikes and (12) connectors. Additional anchoring spikes are available and soldseparately. To cut edging ; use clippers or a hand saw, and cut an equaldistance between two tabs. Always wear appropriate eye protection whencutting.